JLM Table Tennis Academy, Evesham, have lots of exciting opportunities in the month of August. 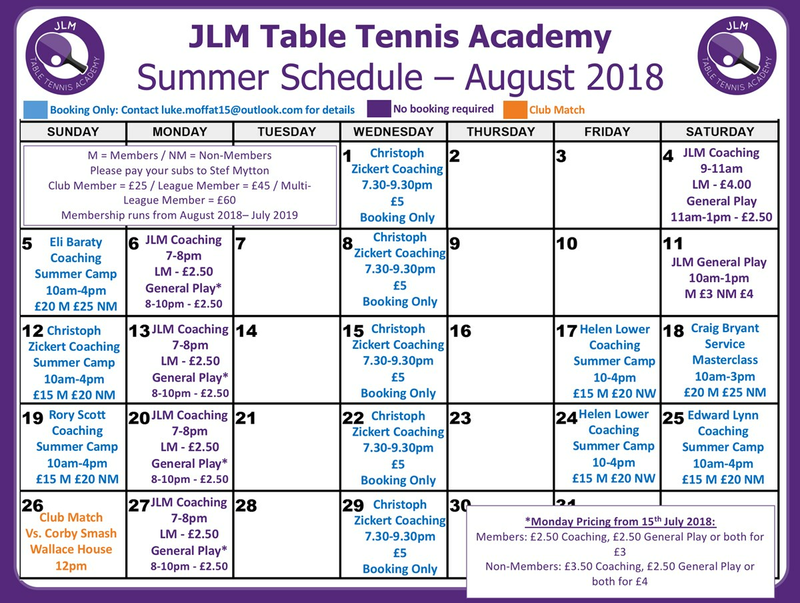 During the month of August, JLM TT Academy in Evesham is offering a plethora of coaching opportunities for all players in the local area. It is important that if you want to participate in any of the sessions that you e-mail Luke Moffat (luke.moffat15@outlook.com) as places are very limited. 5th August: Eli Baraty, High Performance Table Tennis Coach based in London, the session will focus on match practice, technique on both wings and improving your game. 12th August: Christoph Zickert, UKCC Level 2 Coach and Semi Professional Player, the session will focus on improving all shots, multi-ball and video analysis available. 17th August: Helen Lower, UKCC Level 4 Coach and former International player, this session will focus on drills for improving general match play. This session is on a Friday. 18th August: Craig Bryant, UKCC Level 4 Coach and ranked number 11 in the country, Craig will be focussing on service and improving your serves. Craig runs Top Edge Table Tennis Club. This will be an excellent session. 19th August: Rory Scott, UKCC Level 3 Coach and current 26 ranked Vet in the country, Rory is a stalwart of English Table Tennis and will be guaranteed to improve your game, the session will focus on serving, playing against long pimple and general play. 24th August: Helen Lower, UKCC Level 4 Coach and former International player, this session will focus on drills for improving general match play. This session is on a Friday. 25th August: Edward Lynn, Professional Coach and is the Coaching Coordinator for the West Midlands, the session will focus on general match play. We also have Wednesday Night Coaching Sessions from Christoph Zickert on: 1st August, 8th August, 15th August, 22nd August, 29th August. In addition, Luke Moffat, will be continuing to run training and coaching sessions on Mondays 7-8pm and Saturdays 9-11am. No booking required for these sessions, just turn up promptly. For full details, please check out the image and / or visit our website: www.tabletennis365.com/JLM or our Facebook page: JLM TT Academy.